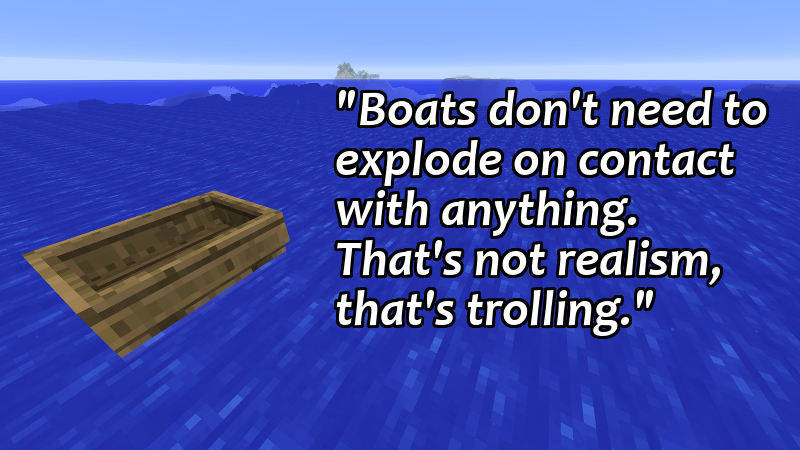 Boats in Minecraft, due to their durability (or lack thereof), have been nigh impossible (or at least highly aggravating) to use on anything but the open sea for years now. One player took to Reddit to vent a bit on the matter. And thank goodness he did. You can’t just get in a boat and go somewhere. You have to bring two or three spare boats just in case a squid pops up in front of you and explodes your boat. ‘Cause that happens in real life. You can’t just stop your boat and get out because it flies off at top speed in a random direction. ‘Cause that happens in real life too; people all the time step off boats with enough force to rocket them out to sea. I’m building an offshore tower right now, and the amount of time I lose trying to get my boat to stay where I put it, I might as well just swim. It’s absurd. Navigating a river? Forget it. The amount of care and practice it takes to not clip any of the corners, it’s faster and easier to just walk along it. I’ve been whitewater rafting. That’s a boat made out of latex, air, and fear, and it slams into huge rocks and doesn’t even care. Here, you consume five cubic meters of solid wood building a boat that can be irreparably destroyed by a glancing blow from wayward chicken. And there’s no alternatives. There’s no ‘reinforced boat’ that you can make, no such thing as a ‘damaged boat’ that can still be repaired, just fragile wooden rectangles and explosive rage. All this great stuff coming out in 1.9, are they even looking at boats? Seriously, just scrap the existing boat code and write something that’s not so atrocious. Boats don’t need to explode on contact with anything. That’s not realism, that’s trolling. tl:dr; Boats are buggy and stupid, they need to be redone from scratch, and everybody knows it but nobody cares. So yeah, some of that would be nice to have in the other versions.